Pamela Riney-Kehrberg. 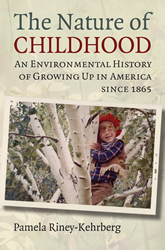 The Nature of Childhood: An Environmental History of Growing Up in America Since 1865. University Press of Kansas, 2014. When did the kid who strolled the wooded path, trolled the stream, played pick-up ball in the back forty turn into the child confined to the mall and the computer screen? How did Go out and play! go from parental shooing to prescription? When did parents become afraid to send their children outdoors? Surveying the landscape of childhood from the Civil War to our own day, this environmental history of growing up in America asks why and how the nations children have moved indoors, often losing touch with nature in the process. In the time the book covers, the nation that once lived in the country has migrated to the city, a move whose implications and ramifications for youth Pamela Riney-Kehrberg explores in chapters concerning childrens adaptation to an increasingly urban and sometimes perilous environment. Her focus is largely on the Midwest and Great Plains, where the response of families to profound economic and social changes can be traced through its urban, suburban, and rural permutations—as summer camps, scouting, and nature education take the place of childrens unmediated experience of the natural world. As the story moves into the mid-twentieth century, and technology in the form of radio and television begins to exert its allure, Riney-Kehrberg brings her own experience to bear as she documents the emerging tug-of-war between indoors and outdoors—and between the preferences of children and parents. It is a battle that children, at home with their electronic amenities, seem to have won—an outcome whose meaning and likely consequences this timely book helps us to understand.